Last night I had an intense dream about meeting a man who wrote for Conde Nast Traveler—a job I covet… deeply. I made a connection there and he was working to get me hired. He threw me with his crew into a rickety van to travel mountainous roads to his next snowy-exotic location. It was a stressful but excellent dream. 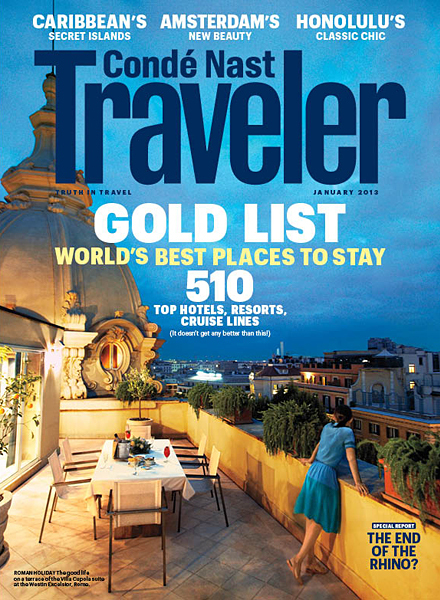 Today I ordered a subscription to Traveler. I felt compelled to do it. In all honesty, I have been thinking about ordering a subscription for a long time. I used to have one and I SO looked forward to my copy every month. I remember reading a feature about Patagonia and how I would have never thought of going there pre-article, but post-article it sounded like the most fabulous adventure. Now, I find myself longing for travel. I find myself longing for adventure. I need the magazine to have something more to dream on—both the travel and the writing. I feel there are miracles afoot. We’ll see what comes.